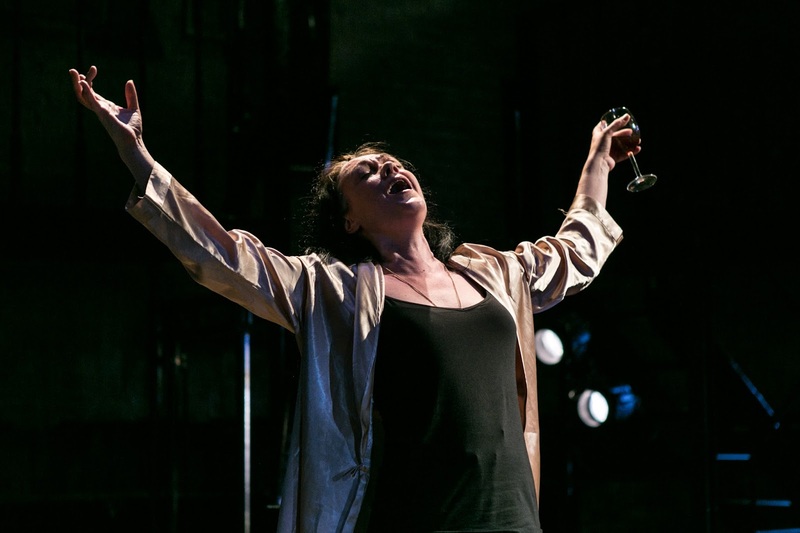 'Pain can blind us, twist us, change us – sometimes for better, sometimes for worse'; writes Eamonn O'Dwyer in the programme notes of his new musical playing at the Arcola Theatre. House of Mirrors and Hearts is an ambitious piece, looking to investigate the oppressive nature of grief associated with loss and its destructive impact on a family unit. It is a chamber musical of intense intimacy, but often shuts the audience out more than it draws us in. It's a shame, as the space feels perfect for the subject matter and yet it is somewhat undermined by some unsympathetic characters and predictable narrative clichés. House of Mirrors and Hearts tells the story of a fractured household. Anna and her two daughters, Laura and Lily, are left reeling after a tragedy throws their previously blissful life into turmoil. For seven years they desperately try to cling to normality, with a veritable powder keg of secrets lying beneath a fragile surface. The uneasy tension of the house is threatened by the entrance of a young intellectual lodger in the form of Nathan and the inevitability of confrontation becomes apparent as the delicate existence of the family becomes increasingly unbearable. The narrative is jagged and harsh, full of fiercely barbed exchanges and frustrated menace. With the exception of a curious finale in which unexplained mysticism and telegraphed 'twists' rear their rather unwelcome heads, the second act picks up immensely. Director Ryan McBryde is given license to let the piece breathe, as the heavy oppression of grief is counter balanced with the discovery of love. This blossoming romance allows Grace Rowe's Laura to explore a more mature sense of identity and Jamie Muscato's Nathan to act as more than a plot device, designed to grease the wheels of the family's existential meltdown. Their cathartic bottle smashing scene is beautifully played and resoundingly resonant. Muscato's performance throughout is impressively nuanced. His ascent to the poetic headiness of first love is utterly believable and he ensures every second of his stage time is detailed and truthful. Molly McGuire is also a highlight as the attention-seeking Lily, providing a pulsating sound with her rich voice and showing a comforting command of the stage. Her number 'Look At Me' is both unsettling and exciting, as she prowls around the stage with equal parts power and vulnerability. Gillian Kirkpatrick, as the alcoholic family matriarch, sings effortlessly and willingly provides some of the more vocally acrobatic elements of the score. Whilst I enjoyed her embittered take on the self destructive Anna, I felt it was a little too unfocused to be as effective as it could be. Her wild, gesticulative wine-sloshing was often more distracting than it was engaging. Eamonn O'Dwyer's score has both a contemporary flair and a more traditional haunting edge, effectively blending the horror of the past with the hope for a more positive tomorrow. The songs, whilst not always tuneful, succeed in their own way; most notably during the occasions where Nathan and Laura bond through musical recitations of Alexander Thornton Grays' verse. There are some playfullly original lyrics dotted throughout the score as well, particularly in Anne's witty ode to the bottle, Something For the Pain. After a slow first half and a group of characters that seem difficult to warm to, House of Mirrors and Hearts discovers its voice in an enjoyable second act. Relationships are allowed to develop and its message of healing through confrontation becomes apparent. It can be a challenging watch at times and with subject matter exploring the depths of human dysfunction following tragedy, this is hardly surprising. However, with some choice performances, an impressive modern score and a chance to celebrate new British writing, House of Mirrors and Hearts is worth your time.